The first TV Writing Master Class in São Paulo took place on May 20 at Fundação Armando Alvares Penteado (FAAP). 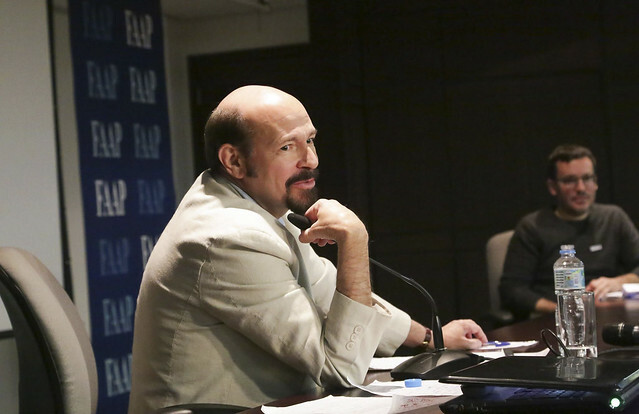 Professor Joe Cacaci (Columbia University School of the Arts), who has taught every edition of the TV Writing course and of the master classes in Brazil, led the class to over a hundred people at the FAAP auditorium on the saturday morning. “Since the first time I’ve taught here, I was impressed with the experience, the talent and the work ethics of the students with whom I’ve had the pleasure to be with. They’re extremely compromised, a crucial point to write professionally for TV”, Cacaci said. In the occasion, Antonio Prata, a well regarded Brazilian author, was in charge of the opening remarks. Prata has recently been to Columbia University as a Visiting Professor to teach about crônicas, the Brazilian literary style of short texts about everyday life. The Master Class celebrates the end of the TV Writing Intensive in São Paulo course, which took place in our satellite office in São Paulo, from May 03 to May 20. Fourteen students were accepted to be part of the two-week intensive course with professor Joe Cacaci and teaching assistant Maria Caú, who advised and helped the students improve their pilots. “I have a strong feeling that at least ten screenplays and pilots from our classes until now [considering the previous editions of the course] will be produced for the Brazilian TV because they’re really good”, Cacaci declares. The course and the Master Class are part of the Columbia Global Centers | Rio de Janeiro expansion to São Paulo, made stronger and possible thanks to our satellite office, launched in the beginning of this year. “The TV Writing course has a strong demand in Brazil, but we believe São Paulo has a broad market, which makes it possible to target professionals both from the cinema and the advertising fields”, says Thomas Trebat, Columbia Global Centers | Rio de Janeiro Director.